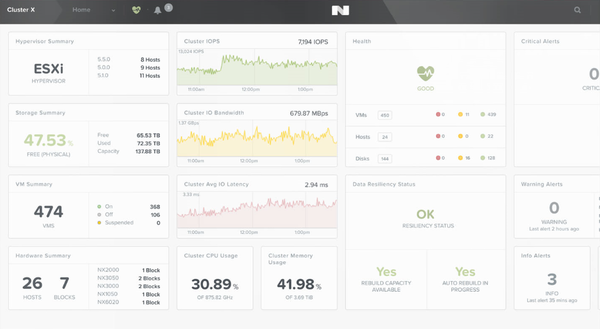 Nutanix unveiled its next generation Xtreme Computing Platform (XCP), designed to allow IT organizations to focus more on applications and services. XCP is comprised of two product families, Nutanix Acropolis and Nutanix Prism. Nutanix Acropolis provides an open platform for virtualization and application mobility. By providing management for storage and hypervisors, Nutanix Acropolis uses App Mobility Fabric to enable VMs to move between hypervisors and high-availability VMs that span hypervisors. Both Microsoft Hyper-V and VMware hypervisors are supported by the storage fabric, but a built-in Acropolis hypervisor built on Linux KVM is the first to plug into the advanced App Mobility Fabric. Nutanix Prism is the infrastructure management tool that delivers IT automation against Nutanix storage, hypervisors and applications. Prism also uses machine learning and business intelligence to analyze infrastructure data and create actionable items that allow administrators to increase performance. Nutanix hyperconvergence turns resources into a private cloud and provides resource management, security, scalability and analytics. Nutanix calls this "invisible infrastructure," and through the automation of the management of the underlying resources, both usage and costs go down while uptime and service levels go up. "The most transformative technologies are the ones we don't even think about. They work all the time, scale on demand and self-heal. In other words, they are invisible," said Dheeraj Pandey, CEO and founder of Nutanix. "Building on our foundation of web-scale engineering and consumer-grade design, we will make virtualization as invisible as we've made storage and elevate enterprise IT expectations yet again." Nutanix uses both hardware appliances and software to deliver its next-generation compute platform. Hardware solutions include a variety of single-, dual- and quad-node appliances. Software solutions come in different packages to meet the needs of differently-sized organizations. The Starter edition provides the core set of functionality, while the Pro edition includes additional data and management features. The Ultimate edition includes all available features and is best suited for multi-site and large scale deployments.